It is always possible that a product that you ordered is not what you were looking for, for example because it does not fit. If this is the case you can send your product(s) back to us within 14 days. To do this you have to register your return. To start your return please press the button ‘’Start your return here’’. After you have registered your return you receive a return form and DPD package label as attachments in an E-mail. Please fill in the return form as complete as possible and put it with the package you want to return. After that you have to put the DPD Package label on the package. (Please make sure the label is clear and visible). The barcode and Retouraddress have to be clearly visible. Remember to remove any old package labels to avoid possible confusion. After this you can drop your package at a DPD parcelshop for free. When processing your return we charge €9,95 to cover the return costs, this amount will be withheld from your refund. 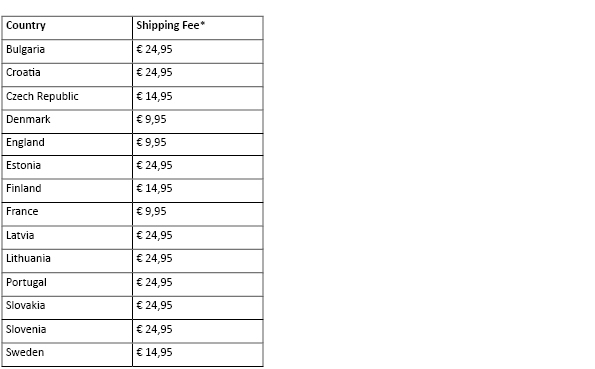 You can also choose to return your parcel with DHL, however these costs will not covered by Agradi and may be higher than using DPD. Returns will be received and processed within 14 days. After receiving your package, you will receive an acknowledgment of receipt by e-mail from us. Within two business days the amount to be repaid will be transferred to you. Parcels that could not be delivered, refused by the recipient, or not collected from a parcel-shop within 7 days, are returned to Agradi. For this method of returns, Agradi will charge 12,50 euro additional return costs from January 1st 2018 onward. If the parcel is returned in the normal way, regular conditions apply, as described on this page. If you receive one or more products that are broken and/or damaged we would like to ask of you to report it and send pictures of the product(s) within 24 hours of delivery to our customer service. To do this please send an E-mail to our customer service at service@agradi.com In many cases damaged or broken products do not have to be returned to us. Unfortunately it is not possible to directly exchange products. If you want a completely different product or the same product in a different colour or size you will have to order and pay for that product using the website. When we receive your return of the original product we will pay back the amount you paid us for that product. Due to technical reasons it is unfortunately not possible to directly exchange one product for another.